We were up at Zodiac tonight sipping Vailima when Agnes and Ben showed up. Agnes and Ben are Americans working at a micro-finance institution. They’ve been here 2 months, and Agnes leaves to go back to The States Monday. Ben leaves the following week. Along with Agnes, there will be 9 Peace Corps Volunteers headed back to America on Monday’s flight visiting for Christmas. “3 more days!” Agnes said gleefully to Chris. I sipped my beer. I chose to not go home for Christmas, and I’m completely comfortable with that decision. But I’m not leaving for Sydney for another 2 weeks, and there’s just nothing to do. With school out of session and the holiday season in full swing, it’s beginning to feel difficult to keep myself occupied. And with the anticipation of Sydney and LSAT scores, time can’t possibly move any slower. It would be a lie if I said I have nothing to do. My house is a mess. I have load upon load of laundry piled up. My computer lab needs work. I have books to read. I’m considering taking the GRE. But it all feels like busy work. It’s stuff I was putting off because things were too busy at school, and now that school’s over the motivation is too. There’s an element of feeling burned out, and lying around Apia marking time isn’t making it better. The plan is to switch things up a little next week. I’m going to go visit Phil on Savai’i for a couple days, and then he and I are heading back to the host village together for a couple more days. It should be a good distraction. 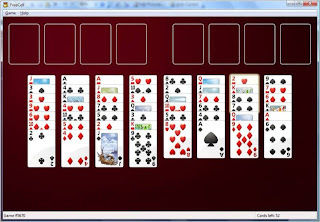 Today I played Freecell and listened to NPR podcasts for a couple hours. Then I turned on Amelié and took a nap. I know. All you worker bees envy this lifestyle. But it can only last so long. Even Freecell has its limitations. Rain drops on my glasses with no rain clouds in the sky. Teachers from my school at the teacher dinner last Friday night. 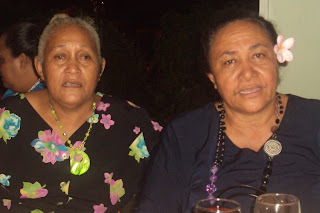 Ms. Saleupolu and Ms. Suasami. 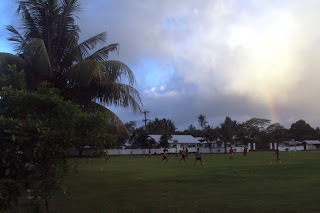 Soccer on my school's field in the shadow of a rainbow. 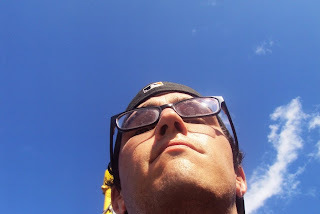 Matt, we really enjoy your blog. In the picture of the teachers you posted, Ms. Suasami looks very familiar to us! We were teachers with Group 15 in 1976 at Aleipata Junior High School in Saleaaumua, and it looks like she might be the same Suasami who we taught with then. Please ask her if she remembers Tavita and Karene, the Peace Corps volunteers who lived in the fale behind the school building.